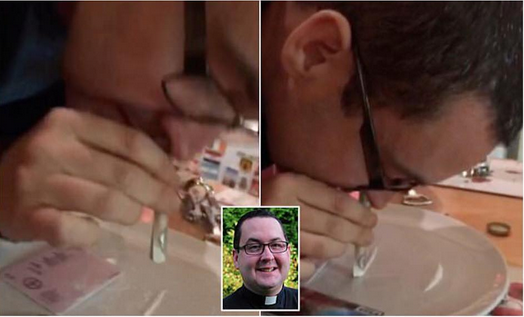 Footage has emerged of a Catholic priest caught on video snorting what appeared to be cocaine. Fr Stephen Crossan is reported to have snorted coke through a £10 note during a night of drinking in his home in July 2015 in Banbridge, County Down. 'I shouldn't' before snorting the white powder off a plate. “It was just the one night and that was it. I do not have an issue with drugs," said Crossman after he admitted to taking the drugs. In his statement, Bishop of Dromore John McAreavey said that Fr Crossan had asked for and been granted leave from his pastoral duties at Seapatrick parish in May 2015. He said he had been receiving counselling and was considering his future. At the start of February 2016, the statement said that the priest had asked for an extended leave of absence from the priesthood. As of now, he is no longer living on church grounds.